Are you looking for a quick and easy Mediterranean recipe that will make your kids say “yum!”? 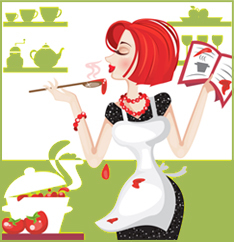 Do you want to prepare a delicious meal without spending hours slaving in the kitchen? Most importantly, do you want to make a healthy dish with seasonal flair from ingredients readily available at your local grocery store? If so, this Proscuitto and Pomegranate Mediterranean salad is just what you need! The pomegranate is one of Christmas’ most distinctive seasonal fruits. Adding pomegranate seeds to this salad make it more than just a heart-healthy, kid-friendly delight – it is also a great dish for whipping up fast and serving at parties, or making for your family for Christmas Eve dinner. Its versatility and easy appeal mean the possibilities are endless. Begin by preparing the mint leaves, proscuitto, and pomegranate seeds. Mint leaves should be carefully sliced into very thin strips. Proscuitto should be done similarly, either torn or cut into thin strips. The most time consuming aspect of this recipe may be the pomegranates – you will need 1/2 cup of pomegranate seeds, but if you are unable to find only the seeds at your neighborhood grocery store, pomegranates will do. If you do not want to spend a lot of time picking the seeds out by hand, ask your kids for help! Kids love finger-foods, and they also love helping out in the kitchen. 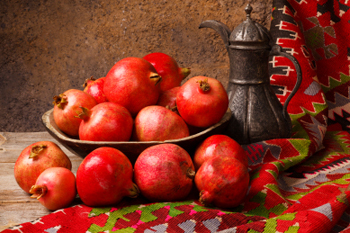 Let them take care of the tricky pomegranate seeds while you prepare all the other ingredients. Start by pouring olive oil into a large salad bowl. Add salt and pepper to taste, but only moderately, in order to protect the delicate flavors of the other ingredients. Next, combine arugula and mint leaves and toss lightly. Finally, separate these mixed greens among salad plates or bowls. Top with the final ingredient, the proscuitto strips. Once your children have finished seeding the pomegranates, rinse them in cold water, remove excess water, and sprinkle them over the top of each salad. You will be surprised how festive the red seeds look when combined with the rich greens of arugula and mint, but you will be even more surprised how much your children will love this healthy recipe! Enrico Fortie writes for the Mediterranean Book Blog to help people learn how to follow the Mediterranean Diet to live healthy and lose weight safely.